Over the past several years, I’ve had the opportunity to design accessory patterns for Cascade Yarns. That designing opportunity led to something else; something much cooler in my estimation. At the start of the year, Cascade Yarns contacted me with a project. They were looking to add crochet stitch gauge information to their website, and in the future, to their yarn ball bands. They asked if I would be interested in doing all the swatching to come up with the gauges. I said that I would. So, since the end of January, I’ve been creating lots and lots of swatches in Cascade Yarns. Small sample of said swatches in progress. So far, I have completed swatches for 18 different yarns produced by Cascade Yarns, and another batch of 5 more yarns should be shipped by the end of the week. What goes into gauge swatching? I decided on a set number of stitches across and a set number of rows to complete in order to give me multiple spots to take stitch count measurements of 4 inches. Next, using yarn weight information from the Cascade Yarns website, guidelines on hook sizes from the Craft Yarn Council, and my own experience of stitching with that weight of yarn, I choose three hook sizes and create a swatch of single crochet stitches with each hook. After crocheting each swatch, I tag it with one of the bead letter markers I created (see Taming of the Swatch for more info), and go on to crochet the next swatch with the next hook. After all the swatches are crocheted, they get wet blocked. I don’t stretch out the swatches when I block them, because my goal is to not distort the stitch count. Rather, I wet block them to clean any oils from handling them as well as to relax the yarn. 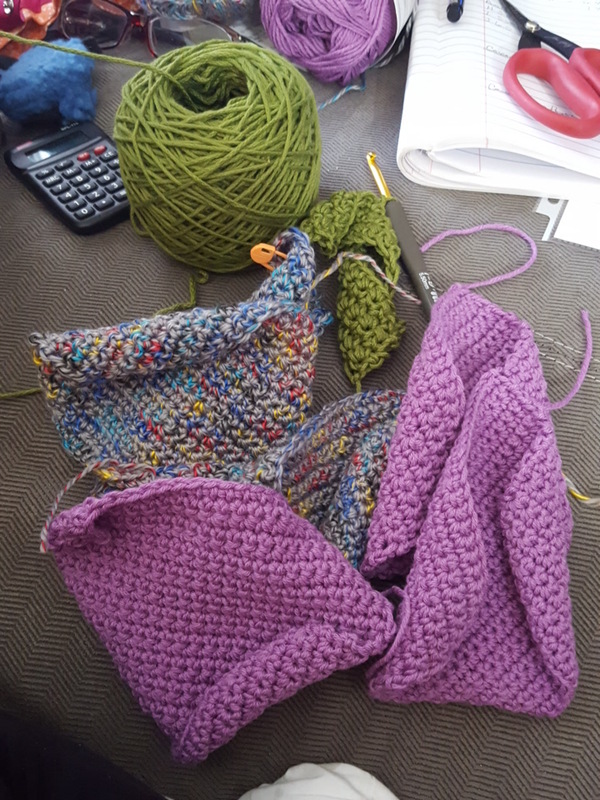 I pin the corners in hopes that they won’t curl (still get some curl, but that is most likely due to the denseness of the single crochet stitch), and once everything is dry and ends are woven in, it is time to measure. I will measure in several spots on the swatch and use the number that most often appears. I record the measurements, then go onto the next swatch. The final step is typing up my findings to send to Cascade Yarns, as well as tagging each yarn with its yarn name, hook sized used for that swatch, and the number of single crochet stitches that equal 4 inches. I’m pleased to report that Cascade Yarns has started posting the crochet gauge info on the website for the yarns I’ve already done. I was really pleased to note that they used ALL of the stitch information I provided, so you will see crochet stitch count info for all three hook sizes that I used. Please check out Sunseeker and Cherub Aran for a couple examples. Other yarns, like Cascade 220, have the place marker on the website for crochet hook size and crochet gauge, and that information will be filled in when that yarn is swatched. I’m really proud that Cascade Yarns is working to become more inclusive of crocheters. They have invested in providing more crochet patterns over the past several years, and the current count of crochet patterns is at 100 free patterns, with more patterns added monthly. With adding crochet gauge to their yarn lines, they are really making an effort to say that Cascade Yarns is a crochet friendly yarn company. I’m very proud to be helping with this effort.